Chronology: CRU's Yamal Deception | Watts Up With That? Please also consider hitting the tip jar. The story of Michael Mann’s Hockey Stick reconstruction, its statistical bias and the influence of the bristlecone pines is well known. Steve McIntyre’s research into the other reconstructions of the temperatures of the last millennium has received less publicity, however. The story of the Yamal chronology may change that. The bristlecone pines that created the shape of the Hockey Stick graph are used in nearly every millennial temperature reconstruction around today, but there are also a handful of other tree ring series that are nearly as common and just as influential on the results. Back at the start of McIntyre’s research into the area of paleoclimate, one of the most significant of these was called Polar Urals, a chronology first published by Keith Briffa of the Climate Research Unit (CRU) at the University of East Anglia. At the time, it was used in pretty much every temperature reconstruction around. In his paper, Briffa made the startling claim that the coldest year of the millennium was AD 1032, a statement that, if true, would have completely overturned the idea of the Medieval Warm Period. It is not hard to see why paleoclimatologists found the series so alluring. Keith Briffa. Some of McIntyre’s research into Polar Urals deserves a story in its own right, but it is one that will have to wait for another day. We can pick up the narrative again in 2005, when McIntyre discovered that an update to the Polar Urals series had been collected in 1999. Through a contact he was able to obtain a copy of the revised series. Remarkably, in the update the eleventh century appeared to be much warmer than in the original – in fact it was higher even than the twentieth century. This must have been a severe blow to paleoclimatologists, a supposition that is borne out by what happened next, or rather what didn’t: the update to the Polar Urals was not published, it was not archived and it was almost never seen again. With Polar Urals now unusable, paleclimatologists had a pressing need for a hockey stick shaped replacement and a solution appeared in the nick of time in the shape of a series from the nearby location of Yamal. The Yamal data had been collected by a pair of Russian scientists, Hantemirov and Shiyatov, and was published in 2002. In their version of the data, Yamal had little by way of a twentieth century trend. Strangely though, Briffa’s version, which had made it into print before even the Russians’, was somewhat different. While it was very similar to the Russians’ version for most of the length of the record, Briffa’s verison had a sharp uptick at the end of the twentieth century — another hockey stick, made almost to order to meet the requirements of the paleoclimate community. Certainly, after its first appearance in Briffa’s 2000 paper in Quaternary Science Reviews, this version of Yamal was seized upon by climatologists, appearing again and again in temperature reconstructions; it became virtually ubiquitous in the field: apart from Briffa 2000, it also contributed to the reconstructions in Mann and Jones 2003, Jones and Mann 2004, Moberg et al 2005, D’Arrigo et al 2006, Osborn and Briffa 2006 and Hegerl et al 2007, among others. When McIntyre started to look at the Osborn and Briffa paper in 2006, he quickly ran into the problem of the Yamal chronology: he needed to understand exactly how the difference between the Briffa and Hantemirov versions of Yamal had arisen. McIntyre therefore wrote to the Englishman asking for the original tree ring measurements involved. When Briffa refused, McIntyre wrote to Science, who had published the new paper, pointing out that, since it was now six years since Briffa had originally published his version of the chronology, there could be no reason for withholding the underlying data. After some deliberation, the editors at Science declined the request, deciding that Briffa did not have to publish anything more as he had merely re-used data from an earlier study. McIntyre should, they advised, approach the author of the earlier study, that author being, of course, Briffa himself. Wearily, McIntyre wrote to Briffa again, this time in his capacity as author of the original study in Quaternary Science Reviews and he was, as expected, turned down flat. As a condition of acceptance authors agree to honour any reasonable request by other researchers for materials, methods, or data necessary to verify the conclusion of the article…Supplementary data up to 10 Mb is placed on the Society’s website free of charge and is publicly accessible. Large datasets must be deposited in a recognised public domain database by the author prior to submission. The accession number should be provided for inclusion in the published article. Was the Royal Society, in a striking contrast to every other journal in the field, about to enforce its own data availability policy? Had Briffa made a fatal mistake? Summer gave way to autumn and as October drew to a close, McIntyre had still heard nothing from the Royal Society. However, in response to some further enquiries, the journal sent McIntyre some more encouraging news — Briffa would be producing most of his data, although not immediately. Most of it would be available by the end of the year, with the remainder to follow in early 2009. The first batch of data appeared on schedule in the dying days of 2008 and it was something of a disappointment. The Yamal data, as might have been expected, was to be archived with the second batch, so there would be a further delay before the real action could start. Meanwhile, however, McIntyre could begin to look at what Briffa had done elsewhere. It was not to be plain sailing. For a start, Briffa had archived data in an obsolete data format, last used in the era of punch-cards. This was inconvenient, and apparently deliberately so, but it was not an insurmountable problem — with a little work, McIntyre was able to move ahead with his analysis. Briffa had also thrown a rather larger spanner in the works though: while he had archived the tree ring measurements, he had not supplied any metadata to go with it — in other words there was no information about where the measurements had come from. All there was was a tree number and the measurements that went with it. However, McIntyre was well used to this kind of behaviour from climatologists and he had some techniques at hand for filling in some of the gaps. Climate Audit postings on the findings followed in fairly short order, some of which were quite intriguing. There was, however, no smoking gun. There followed a long hiatus, with no word from the Royal Society or from Briffa. McIntyre would occasionally visit Briffa’s web page at the CRU website to see if anything new had appeared, but to no avail. Eventually, though, Briffa’s hand was forced, and in late September 2009, a reader pointed out to McIntyre that the remaining data was now available. It had been quietly posted to Briffa’s webpage, without announcement or the courtesy of an email to Mcintyre. It was nearly ten years since the initial publication of Yamal and three years since McIntyre had requested the measurement data from Briffa. Now at last some of the questions could be answered. When McIntyre started to look at the numbers it was clear that there were going to be the usual problems with a lack of metadata, but there was more than just this. In typical climate science fashion, just scratching at the surface of the Briffa archive raised as many questions as it answered. Why did Briffa only have half the number of cores covering the Medieval Warm Period that the Russian had reported? And why were there so few cores in Briffa’s twentieth century? By 1988 there were only 12 cores used, an amazingly small number in what should have been the part of the record when it was easiest to obtain data. By 1990 the count was only ten, dropping still further to just five in 1995. Without an explanation of how the selection of this sample of the available data had been performed, the suspicion of `cherrypicking’ would linger over the study, particularly since the sharp twentieth century uptick in the series was almost entirely due to a single tree (It is true to say, however, that Hantemirov also had very few cores in the equivalent period, so it is possible that this selection had been due to the Russian and not Briffa). The lack of twentieth century data was still more remarkable when the Yamal chronology was compared to the Polar Urals series, to which it was now apparently preferred. The ten or twelve cores used in Yamal was around half the number available at Polar Urals, which should presumably therefore have been considered the more reliable. Why then had climatologists almost all preferred to use Yamal? Could it be because it had a hockey stick shape? The low core counts in the Yamal series certainly looked odd, but when they were seen in the context of Briffa’s 2008 Royal Society paper they looked positively suspicious. In the paper, Briffa had explained that he and his co-authors had combined series so as to create regional chronologies covering much wider areas. These regional chronologies, he suggested provided “strong evidence that the extent of recent widespread warming across northwest Eurasia, with respect to 100- to 200-year trends, is unprecedented in the last 2000 years”. One of Briffa’s regional chronologies was AVAM-TAIMYR, which was produced by merging the Taimyr chronology with another site, Bol’shoi Avam, located no less than 400 kilometres away. While the original Taimyr site had something of a divergence problem, with narrowing ring widths implying cooler temperatures, the new composite site of Avam–Taimyr had a rather warmer twentieth century and a cooler Medieval Warm Period. The effect of this blending of datasets was therefore, as so often with paleoclimate adjustments, to produce a warming trend. This however, was not what was interesting McIntyre. What was odd about AVAM-TAIMYR was that the series seemed to have more tree cores recorded than had been reported in the two papers on which it was based. So it looked as if something else had been merged in as well. But what? With no metadata archived for AVAM-TAIMYR, McIntyre had another puzzle to occupy him, but with some effort he was able to unravel the mystery. Forty-two of the cores turned out to be from another location called Balschaya Kamenka, some 400 km from Taimyr. The data had been collected by the Swiss researcher, Fritz Schweingruber. The fact that the use of Schweingruber’s data had not been reported by Briffa was odd in itself, but what intrigued McIntyre was why Briffa had used Balschaya Kamenka and not any of the other Schweingruber sites in the area. Several of these were much closer to Taimyr — Aykali River was one example, and another, Novaja Rieja, was almost next door. The suspicion of cherrypicking was hard to avoid. But there was another mystery in Briffa’s paper too. As we have seen, Briffa had been in the business of creating regional chronologies, for example supplementing Taimyr with data from other locations such as Avam and Balschaya Kamenka. Similar regional chronologies had been created for Fennoscandia and allegedly for Yamal. But the Yamal data appeared to represent only the original Hantemirov and Shiyatov data with no supplementation with other sites in the area at all. Why had Briffa left Yamal on its own, when the core count was so low? Suitable data was certainly available – Schweingruber had collected samples at a site called Khadyta River, close to Yamal, and with 34 cores recorded it represented a much more reliable basis for reconstructing temperatures. McIntyre decided to perform a sensitivity test on Briffa’s database, replacing the 12 cores that were behind the twentieth century uptick in the Yamal series with the 34 from Khadtya River. The revised chronology was simply staggering. The sharp uptick in the series at the end of the twentieth century had vanished, leaving a twentieth century apparently without a significant trend. The blade of the Yamal hockey stick, used in so many of those temperature reconstructions that the IPCC said validated Michael Mann’s work, was gone. McIntyre has based his ‘critique’ on a test conducted by randomly adding in one set of data from another location in Yamal that he found on the internet. People have written theses about how to construct tree ring chronologies in order to avoid end-member effects and preserve as much of the climate signal as possible. Curiously no-one has ever suggested simply grabbing one set of data, deleting the trees you have a political objection to and replacing them with another set that you found lying around on the web. A few weeks later, Briffa and some of his colleagues joined in, writing a long response to McIntyre. Interestingly, this took a slightly different line to their colleagues at RealClimate, acknowledging that Khadtya River met the criteria for inclusion in the the Yamal chronology, but claiming somewhat implausibly that they had not considered it at the time. Judged according to [our normal] criterion it is entirely appropriate to include the data from the [Khadtya River] site…when constructing a regional chronology for the area. However,we simply did not consider these data at the time, focussing only on the data used in the companion study by Hantemirov and Shiyatov and supplied to us by them. More interesting all the time…. Let the Mannian evasions resume…. Thanks to Steve, Anthony, Andrew, and all who devote so much careful work to informing all of us! And just how many hundreds of billions of dollars have been wasted on climate research as a result of Briffa and Mann’s deception, fraud and duplicity? And just how many politicians have been duped by this nonsense? If it had not been for McIntyre’s tireless efforts the fraud perpetrated by these two ‘climate scientists’ would have never been uncovered – we all owe a debt of gratitude to him. Perhaps the time has come for sceptics to fund some real independent scientists to go to these places and take tree core samples. I, for one, would be prepared to make a significant contribution towards the funding of such a project. Stress the words: real, independent and scientists. How do other readers feel? The cost of such a project would be somewhere around $75-100,000. Any chances of getting a government grant for some real climate research? Only in your dreams. Para 2 – “IT [It] is easy to read, easy to follow, and comphrehensive [comprehensive]. How these guys up to now still get away with this deceit, is beyond comprehension. Meanwhile, Briffa is never to be heard from again. Will he ever react, maybe to this new revelation? Serious cliffhanger. I can’t wait! Great summary. Even Revkin should be able to follow this. I still think you folks have got this round the wrong way if you think evil scientists have duped poor harmless politicians. These sub-par scientists were recruited IN ORDER to produce these results. Wind power has been sold as the ‘new North Sea Oil’ to politicians, and they want those revenues. This is also the reason why there is no appetite for exposing or prosecuting these scientists. Lies, damn lies and climate reconstructions. On another note it sure is a good thing Biffra adjusted down the climate signal to account for the 20th century rise in CO2 stimulated growth less cause and effect be conflated. He did account for increased plant growth in response to higher CO2 right? Then they fret over declining trust in climate scientists. I vaguely recollect that the Royal Society’s motto is something like “on no one’s word” therefore the Steve McIntyre was and is doing what the Royal Society expects of him. As for the rag Nature, that’s another matter. This entire episode might turn out to be one of the greatest scientific scandals of our age. In fact it already is. Excellent work by the ‘Bishop’, WUWT, many other blogger-journalists and Steve McIntyre, who deserves a Nobel prize for his unrelenting persistence in uncovering deliberate scientific deception. The hockey team just became the hokey team. It currently appears that patient zero was an IDL program known as “FOI2009/FOIA/documents/harris-tree/briffa_sep98_e.pro”. Small wonder that Briffa has gone silent… any further word from him could lead to more inquiries and FOIA requests- can’t have that! Interesting how Briffa went from declining temperatures post 1940 in his 1998 paper, to claiming rising temperatures from a much smaller data subset, just 2 years later ! Unfortunately, any research that was inconvenient would not get past the gatekeepers. Or just go to Hill’s site. Time for a knighthood for Steve. Quote from D’Arrigo (Team Member) on data selection. Enhance the desired signal- is that the one that shows an upturn in the 20th Century? Just imagine that this was a drug trial. It started off with 100 volunteers. By the end of the trial 90 had dropped out because of adverse side effects. The remaining 10 showed “the desired response”. This “adjusted” data was then used to file for a licence for this drug. No prizes for guessing what would happen when the deceit was uncovered. On a more serious note the type of data analysis that “The Team” are using is called a “post-hoc” test. It does have utility in finding patterns within large datasets that would otherwise be obscure. Needless to say such an analysis requires careful control measures to avoid Type I statistical errors- in short false positives. Of course “The Team” is noted for its diligence and expertise in this area. Informed the Norfolk police of a likely crime at the UEA. Asked my MP (Jo Swinson) to inform the appropriate parliamentary authorities that they appear to have been lied to. Written to Sir Muir Russell (by way of the judicial appointments board) making him aware of these allegations. Initiated a complaint with the UK civil service against Sir John Beddington. Unfortunately, if I remember correctly the Norfolk Police are the same constabulary that raided Tallbloke’s home and rifled through his computers looking for ‘Climategate’ evidence, I doubt that they will change sides at ScottishSceptics request. REPLY: No, it WAS right…but Bish somehow republished the piece, and it changed the date portion of the URL, breaking every external link. It’s not the renewed North Sea revenues that interest them its the idea of taxing carbon. You tax carbon and you tax everything. Transport, industry and life itself. It’s the proverbial “taxing the air we breath”. That is why they get vindicated by white-wash inquiries again and again, and that’s why Gleik has not been charged with the slightest misdemeanor despite what seems like a clear confessed act or wire fraud, that carries a 20 year penalty. They are government paid scientists doing the government’s bidding, that’s how they escape prosecution. It’s like the chances of a cop getting prosecuted. It does happen but it takes something on the scale of the LA riots to make it happen. By God, these Buggers need to be held to account in a court of Law! Is Lord Monckton aware of this and can he use his intellect (higher than mine) to bring these liars to Justice? Or for that matter, is there anyone out there? I still think you folks have got this round the wrong way if you think evil scientists have duped poor harmless politicians…. Oh I think at least some of us have the (hockey?) stick the correct way round. Big Money => Political Campaigns => election of bought and paid for Politicians => government grants => bought and paid for scientists => Predetermined “Catastrophic” results => Propaganda Campaign by bought and paid for Mass Media => “Popular Hysteria” => bought and paid for “Green” Lobbyists => Political resolutions, laws and subsidies => Tax payer money flowing into the pockets of Big Money. Great work, Andrew. Concise, logical and understandable as usual. Thanks to Steve Mac as well. In the last few day the folks at CRU and Mann himself have been called liars and fraudsters. I vaguely recollect Mann saying that he had had enough and was prepared to sue people in court. Aside from the Ball case have any of these climate adjusters initiated any legal proceedings? The whole green energy deal, while it has potential if it was run by real people, has been pushed by very large scammers. These guys are persuasive and it would not be a stretch to think that ‘progressive’ types involved in research would fall in line to ‘support the cause’. Even in the middle of Illinois wind turbine placement is stopped because the gov’t might turn off the money tap – seems like the management is only interested in getting money now instead of the long term investment most power generation facilities represent. In the real world the ending of govt support would have been part of the plan. On the common sense side – anyone with an engineering/scientific (or not) background looks at the hockey stick and says ‘it doesn’t happen that way or else it would have happened before and we wouldn’t be here’ (we are not the first to introduce more CO2 the atmosphere). Also, coming out with the consensus argument 22 minutes after it was determined that we somehow have global warming (man made even) should have been one of those ‘now wait a minute fella’s’ moment. Sounds more like an excuse made by 3 10 year olds when caught stealing candy. Then there are the leaders jetting around telling everyone to ride bicycles and live in mud huts while they suffer in luxury. Instead of some sort of real education process with repeatable studies, etc. to prove the point, anyone not on board is a denier. The topper is that all the solutions just transfer money to the leadership and have little effect on the evil substance CO2. While it’s important for guys like McIntyre to go through the exercise to debunk the issue, it should have been regular people that raised and eyebrow and noted we were not interested in the bridge they had for sale either (not even with the ginsu knife set thrown in free). Just a an observation of the bounty of websites set up to win global warming converts and put down the deniers (haters?). The faith of these folks is amazing – it truly takes less faith to believe in a risen savior than global warming. mfo that ditty brought a smile to my face, but on reflection I’m not at all sure this is a smiling matter. I’ve always been more inclined to think CAGW was based on incompetence enhanced by self-interest. But accounts such as this imply the complete, complicit corruption of science. I hope the facts are right and that investigative powers will be rigorously applied to uncover the truth. Why are we using ‘tainted data’ from years ago which obviously has been cherry picked. We need new tree core samples from strategic locations around the world which would be totally transparent so that no conclusions could be fabricated, and that all scientists could review. Why are we still referring to this old data, which is obviously unreliable? “CAGW was based on incompetence enhanced by self-interest” to begin with it probably was. “complete, complicit corruption of science” is what came next, partly to cover up the earlier incompetence. Moreover the whole fraud has been going on for long enough that the field must by now have recruited some people who’ve been crooks throughout. Maybe if this gets enough news down here we can stop this moronic CO2 tax before it even starts !!! Yup. That says it all. Also “found lying around on the web” is RC. Others please correct me if I’m wrong but I understand that it’s not a problem with the present cores per se or even the number which exist but that the problem is that a) most of the cores don’t show a hockey stick but CRU etc, just pick the tiny handful which do, and b) that trees are poor thermometers anyway. I don’t know how collecting more cores would address either problem any more than properly analyzing the cores we already have (which Steve and no doubt others are already doing). Collecting more cores would almost certainly show more of the same – only a tiny fraction with hockey sticks and zero being reliable thermometers. But we can already demonstrate that with existing cores and surely any sceptics resources would be better focused on more productive areas..
Don Keillor, I have a better example than your proposed drug trial. What if we sent e-mails to 10 thousand scientists asking about their stance on Global Warming. Based on the responses, and non responses, we cut the pool to 35 hundred. Then after a series of more precise selections we boiled the original 10,000 down to 79 responders and got agreement from 77 of them on our hypothesis for a 97% success rate. And then we get the whole mess peer reviewed! Most of them saw the cash ‘n’ power possibilities and bought into it with open eyes. The only one on this side of the pond who could lay claim to being duped would be Nancy Pelosi — but she’s got the intellectual acumen of a bag of wet mice. Thanks for the link! The story is an easy read. And why we should place any trust in these kind of scientists? This has been the main modis operandi since the mid-1980s. It would be unexpected to find any climate data at all that has not been selected/adjusted/hidden/distorted in order to further the belief. The scientists who have helped in this effort get promoted and receive medals. The scientists who try to present objective information get disinvited. It is almost unbelievable that this kind of thing can happen in our modern world. But there it is. Great summary of the dogged determination by Steve to reproduce the results of the original data mining exercise. Make that the nitty gritty work Steve has, and continues to put in, to gain an understanding of the details of how data was selected for inclusion in the data mining exercise; of what one might call a rather important factor in various policy discussions on the need to do something right this minute to mitigate the steep uptick in temperature. I was taken back to a failure investigation from my youth. It’s amazing what can happen in the real world when your flyer removal criteria (say when the n for cores goes from x to <50% of x) isn't well documented. Certain US governmental agencies frown upon the practice as it may effect the health of folks. In fact, if they think you were hiding the little details that have big impacts on the output of a clinical study they may begin to question your integrity. Depending on how you look at things you might conclude that the constables went to the wrong location recently over in the UK. Regular people have been raising eyebrows and saying ‘we are not interested’ for over 20 years now. The main players in this myth building, the climate community, government and the media, all benefit greatly from the myth. The information required to counter the myth has always been in the possession of the climate community and government, Consequently, it has been difficult to come by. Nonetheless, the fallacy of the myth was apparent to countless thousands, even though they did not have the specific data to disprove it. Hence we had the rise of the Oregon Petition, the late John Daly’s ‘Still Waiting for Greenhouse’, and eventually sites like Climate Audit and WUWT. I became a climate change crisis skeptic around 1990, but felt I was completely alone until a few years later when I heard Bill Gray decimate the AGW argument at a hurricane conference. His points were obvious to me and many other people in the room. Finally, I was not alone. Yet we had no idea what we were up against. At the time, I thought science was a noble profession that would not stand for the deception. I have come to find out, that when money and power are running the show, nobility is not allowed in the theater. Yes, Steve McIntyre is a hero for having the tenacity and statistical knowledge to persevere in the quest for smoking guns, but there are countless individuals who have been pointing out that the Emperor has no clothes for a very long time. Despite the best efforts of certain parts of the climate community and world governments to prop up the myth and hide all the smoking guns, the myth is grumbling. In the end, there will be heroes, but the tide is turning because of skeptical voices everywhere, from the grocery store to the front page of the New York Times, demanding the truth. Dendroclimatology is something akin to casting runes. It is not feasible to assess temperature using tree ring thickness there are too many other variables that can cause growth rates to change. If someone wants to use treemometers then all they have to do is pass some simple validation tests. The instrumental era now goes back more than 150 years. It is simple to provide tree cores in double blind validation tests. Therefore, accuracy and precision claimed can be validated. However, I would point out that the famous ‘hide the declime’ phrase was coined precisely because the Briffa treemometers were showing a rapid temperature DROP when the world was actually warming; and therefore the treemometers had failed validation. It was the lack of validity of tree rings as temperature metrics that the ‘team’ was really hiding. Unvalidated, dendroclimatology is in the same camp as astrology but with less proof and any papers based on it should be discarded. Aren’t you being a bit hard on the mice Bill? Perhaps after they were drowned and dead, the equivalency may be made. After all these years, I hope CRU’s hijacking of science comes to an end. This thread has the longest loading/refresh time of any posting I have seen in the last 4+ years, must be a lot of traffic. A sincere thank you to Bishop Hill, Steve McIntyre, Anthony Watts and all the others dedicated to exposing the truth. You have really hit the nail on the head. When the result did not support the motive, the data were fudged. This was ‘ok’ because trees are lousy thermometers anyway, so who would ever know? What is becoming clear from the compressed versions of Briffa’s sorry tale, starkly so, is the level of collusion at the editorial level of Science and Nature in perpratrating this scientific fraud. It should be easy for the readership of these publications, and any other journals that violate their own data archiving rules, to drive a wedge between these mainstream publications and the CRU’s stinking, sinking motley crew of lying weasels. These epithets are chosen carefully. The stench of malfeasance is unmistakeable from beginning to end. The ship of CAGW that has borne the motley crew to so many exotic shores is awash to the gunwales, floundering in an ocean of truth and, sharks circling, is fore-doomed to deeps. That they are lying is established beyond all doubt. The case for weasling to avoid discovery and exposure is ably proven by the behaviour of the central authors with the collusion of no less than senior staff of some of the most prestigious publications in the world. Science, Nature, for how long will you protect this wretched lot? They have been adrift from the shores of truth for so long they have contracted intellectual scurvy and are losing their teeth. Editorial staff no longer need fear their bite. Phil the Captain and Gavin the gunner can no longer protect their precious cargo of carefully selected exotic wood. Iti s time to change course. This is an amazing story. There surely are many among my family and friends, well intentioned people who are sincerely concerned for the future of mankind and our planet. . . who have been terribly misled into believing that we are in great peril from CO2. . .For the most part they cannot read the truth in any common media outlets. We really must do our best to spread the word ourselves. We must share well documented shameful acts of deception like this. . . The problem really is, that people must be motivated enough to spend some effort on educating themselves. . . and not be led like sheep. . .It’s so much easier to feed on the predigested pablum, than to dig for the more nourishing roots of truth yourself. . . I really thank everyone for the time and efforts devoted to this website. You are really doing all of humanity a huge service, whether humanity realizes it and appreciates it or not. . . Thank you all. . .
Back at the start of McIntyre’s research into the area of paleoclimate, one of the most significant of these was called Polar Urals, a chronology first published by Keith Briffa of the Climate Research Unit (CRU) at the University of East Anglia. At the time, it was used in pretty much every temperature reconstruction around. Time/date of this, Briffa’s (first) publication? Knowing this will make make some other parts of the chronology more evident. Yamal saves the day [blank spot + indent] Keith Briffa. Maybe a photograph of Briffa is skipped, but space was formatted to be placed here originally? Maybe that whole sector of Russia could be dubbed The Cherry Orchard. It is 10 years since the hockey stick was invented. In the meantime the UK has introduced a Climate Change Bill with practically no discussion in Parliament. So as far as we are concerned the damage has been done and CRU has achieved what it set out to do. It is highly commendable that Steve Macintyre was able to eventually uncover the deception. It shows just how weak the so called peer review system is for these so called scientific studies and papers. Why are you even bothering to discuss this? The great and all-knowing Mann has declared that it is “largely irrelevant”. All hail the great and all-knowing Mann, the final arbiter of all that is largely relevant. I am appalled. Twenty odd years ago i did a masters thesis in the obscure field of forest pathology. As part of the little thing i compared growth rates between healthy and infected trees. I was more than a little skeptical of the results because i had only used data from 40 or so trees. As it turns out, I had enough raw data to dictate energy policy for the whole world, if only i had done the right statistical analysis. That’s very unlikely, at least in the US. Our laws allow for “discovery” by the defendant, which would open all of Mann’s climate records and emails which he has so diligently fought to keep secret. It would be interesting if a knowledgeable person were to pick 10-12 of the trees that provide the wrong message and do an analysis. The upside down hockey stick would be a nice lever to show people who think this is nick picking. Thank you Wu. I’d been wondering why there had been no reaction to the many open accusations of fraud. It certainly adds to the veracity of the accusations. I have two trees in the yard. The other tree took great exception to the motorcycle leaking oil around its roots, and a core of its rings will clearly demonstrate that we are just entering an Ice Age. Apart from that, dendro-thermology and dendro-chronology are really scientific concepts that are 100% accurate. Some of the comments say some disparaging things about the basic idea of tree ring studies. Before rejecting the field out of hand, consider that the Chinese have published a study on trees on the Tibetan plain. Their findings correlate very well with other researchers. They pick up the LIA, and the MWP, for instance, but they do NOT show anything that remotely looks like a hockey stick. They have identified patterns in the data, as well as what they believe to be the main drivers of climate trends. Their prediction is that we are entering a multi-decade cooling period, from which we will emerge in 2068 (plus or minus) and that 2006 was the high temperature mark for the most recent warming cycle. I know there are too many studies to keep with all of them, but I would be interested in reading what the bloggers here think of that particular paper. Does anyone know if the most influential tree (YAD061) were removed from Yamal, would there be any hockey stick for that set? Can someone still find that particular tree to get cores from? Seems like quite an outlier whose time to become kindling wood is long overdue. Is Keith Briffa the Joe Biden of climate science? Keep him away from the media before he opens his mouth again. Without YAD061 there would not be a hockey stick shape. What tree this is, I think I know. It grew in Yamal some time ago. In hopes a hockey stick will grow. No tree, the stick did disappear! To make that stick reappear. There were some corings from a lake. And other data I could bake. Another hockey stick I’ll make! I changed a line into a hill! I can’t say how I was thrilled! Then Climategate. I’m feeling ill. This is really a far- out WAG, but how likely is it that Keith Briffa is a lot more closely involved with FOIA than anyone thinks? OOPS! I forgot the title! Or maybe it should be “Chopping Up Wood on a Snowy Evening”? Is Keith Briffa the Joe Biden of climate science? Keep him away from the media before he opens his mouth again..
Oh, I hid the first for another day! >>about the basic idea of tree ring studies. Of course, because there are so many variables that will effect tree-ring growth, from nutrients to moisture, to other dominant vegetation to disease and pests. Oh, and temperature – sorry, did I forget temperature? Silly me. And as for dendro-chronology, even if you find a pristine reference-sample tree that reflects only climate, your sample of interest may be anything but pristine. The sample for dendro-dating may have had an overbearing neighbour for two decades, and then two decades in the sunshine, and then three decades of infestation. Just how can you compare its rings with a reference sample? What results will you get? But the tree study on the Tibetan plain appears to correlate fairly well with other proxy data even as it rips the heart out of Mann’s hockey stick. I’m just saying that based on this other study, it might not be dendro-chronology itself that is faulty. One way scientist can avoid cherry picking is by letting nature select the sample. To illustrate how that is done, look in “Climate, History and the Modern World” by Dr. H. H. Lamb, and open it to the chart on page 142 of “Changes in the height of the upper tree line in two areas in the White Mountains, California and in the Alps in Switzerland and Austria (From work by V. C. La Marche and V. Markgraf)” for the last 6,000 years. 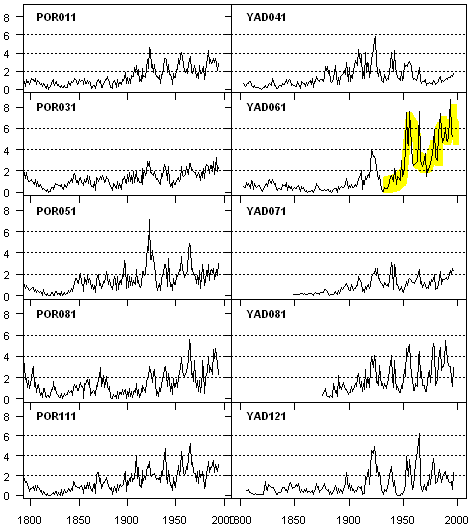 The charts show tree lines were much higher than present (meaning it was warmer) for the entire 6,000-year period, and in recent periods both charts clearly show the Medieval Warm Period and Little Ice Age. The sample did select itself. All the scientist needs to is to see if there is evidence of a certain type of tree previously growing at a higher elevation, or further north than now. The trees don’t lie, and they don’t need their rings measured and interpreted as to temperature, moisture, changes in solar exposure, fertilization, &etc. It’s quite simple, really, If a certain type of tree once grew 100 meters above where they now grow, it was warmer then than now. If a certain type of tree once grew 200 to 400 kilometers north of where they grow now, it was warmer then than now. The evidence of the trees’ former habitat is easily determined by stumps and other woody artifacts, which then leads to the comparative ease of determining when they were there through carbon dating. If trees can no longer live somewhere because of changing conditions, they won’t, and have no choice in the matter. Concerning tree rings, and in particular bristle-cone pines in the White Mountains of California, Professor V. C. La Marche at the Laboratory of Tree Ring Research at my alma mater, University of Arizona, Tucson, has constructed a chart indicating variations of summer warmth and/or its seasonal duration covering the past 5,500 years (see page 141 of Lamb). Unlike Mann’s and others’ studies involving these upper-tree line bristle-cone pines, La Marche’s study shows great variation over the 5,500-year period, with six warming and cooling periods including a very prominent Medieval Warm Period and Little Ice Age, with current warming beginning over 200 years ago. This is science. It clearly shows that current warming is not unprecedented, but in fact is normal if a bit cooler than previous periods of warming. It also lends great weight to the argument that climate change is normal and has occurred without the aid of humans – or of CO2 instigation, since the AGW believers posit that atmospheric CO2 was stable for this entire period of significant warming and cooling – is supported by a robust body of scientific evidence, far superior to the thin, short time period, model driven body of science that finds an insignificant trace gas rules climate change. Only believers, not scientists, could hold out against such overwhelming evidence.